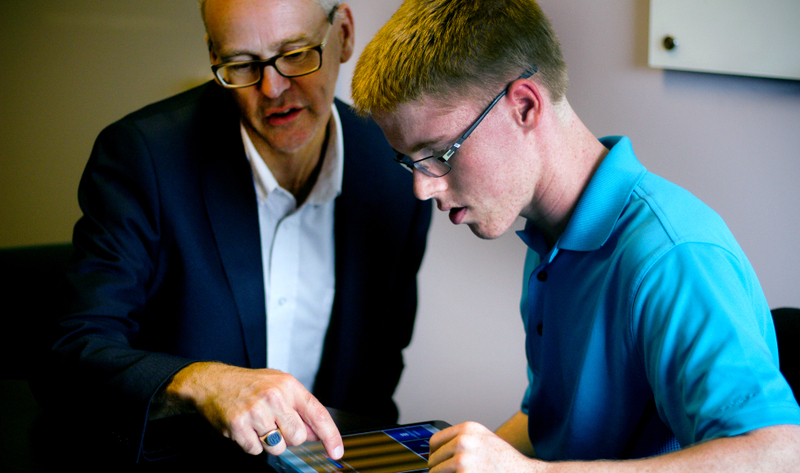 Jan Willem Gorter helps patient Kyle Chambers navigate the transition from the pediatric to adult health-care system. The transition from childhood to adulthood can be a difficult time for many. But for those with developmental disabilities and chronic health conditions, the transition can seem insurmountable. Jan Willem Gorter is a clinician and researcher at McMaster University working to make this transition easier. Trained in pediatric and adult rehabilitation medicine, Gorter works at McMaster Children’s Hospital as a physiatrist in a clinic specifically aimed at helping teens with health challenges move into adulthood. The majority of his patients have cerebral palsy, which is the most common physical disability in pediatric rehabilitation. He’s also focused on helping youths with spina bifida, acquired brain injuries, and other developmental disabilities. As a researcher, he draws on his clinical experiences to conduct studies and develop health-care interventions that will have a direct impact on patients, their families and those working in the health-care system. His work has been recognized with the Scotiabank Chair in Child Health Research. To make sure youth with disabilities are on a healthy trajectory, Gorter leads the Stay-FIT program which studies the effects of physical activity and an active lifestyle intervention for youth with cerebral palsy. Gorter and his team developed TRANSITION-Q, a new self-management measure for adolescents, aged 12 to 18, with chronic health conditions. The questionnaire includes a range of skills that vary from those that young adolescents should be able to do, such as answer a doctor’s or nurse’s questions, to skills that may require instruction or training, like booking a clinical appointment. Health-care providers use the tool to better understand patients’ strengths, as well as areas for improvement. Gorter is working to integrate TRANSITION-Q into clinical practice across Ontario. Gorter’s team has also developed and is evaluating an app-based transition toolkit called MyTransition that allows youths to describe their health condition, raise important health needs in new situations, and measure skills related to managing health. Gorter is also a co-lead-investigator on the CHILD-BRIGHT – READYorNotTM (READiness in Youth fOR traNsition Out of pediaTric Care) Brain-Based Disabilities Project, where researchers at McMaster and McGill universities are developing and evaluating e-health aids to help young patients with cerebral palsy, spina bifida, autism, epilepsy or fetal alcohol spectrum disorder, and their families, make a seamless transition from the pediatric to adult health care systems. 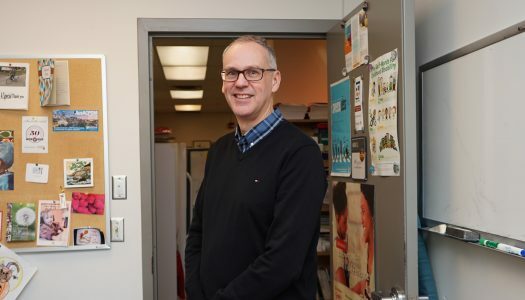 Gorter says teamwork is at the heart of his research, and that he emphasizes collaboration as director of the CanChild Centre for Childhood Disability Research. CanChild is dedicated to generating knowledge and transforming lives of children and youth with developmental conditions and their families. Peter Rosenbaum, co-founder of CanChild and professor in the Department of Pediatrics at McMaster, says Gorter has continued the tradition of excellence at CanChild. “Jan Willem has boundless energy, infectious enthusiasm and an ability to connect and network with colleagues everywhere – whether in the next office or on the other side of the world,” says Rosenbaum, who is also a developmental pediatrician and health services researcher. Rosenbaum and Gorter are the lead authors behind a transformative 2012 paper titled: “The ‘F-words’ in Childhood Disability: I swear this is how we should think!” Inspired by more than two decades of CanChild research and continual discussion amongst members of the CanChild family, the paper features six F-words that the authors state should be the focus in childhood disability. These words are: function, family, fitness, fun, friends, and future. Gorter says he has always had an interest in helping others. Growing up in the small town of Krommenie in the Netherlands, he was an avid sailor from a young age and spent much of his youth teaching other kids to navigate the waters. His grandfather then father served as the town’s only notary lawyer, and he credits his mother for his interest in medicine. She worked as an assistant to a local physician before starting her family. Gorter completed his medical degree at the University of Amsterdam. His rotations in medical school allowed him to work with patients facing different health challenges. A research placement focused on the all-encompassing impact of rheumatoid arthritis on seniors led to an interest in rehabilitative medicine. Gorter did his mandatory military service at a military rehabilitative centre situated near Utrecht. He earned a PhD at Utrecht University. In 2000, he finished his post-doctoral training as a physiatrist, and followed his passion to help children with disabilities and their families. He was recruited to McMaster by Rosenbaum in 2008. Although he had established a research network called NetChild in the Netherlands and was leading a research program, he decided to relocate to McMaster and establish himself as an international leader in the field of transition to adulthood. Gorter and his husband, Ton de Kok, currently call Dundas home. De Kok, a former social worker, runs the local Homestead 1867 Bed and Breakfast. In good weather, the couple can be found sailing on Lake Ontario. Gorter also enjoys playing euphonium in the Dundas Concert Band. They return to the Netherlands three or four times each year, as Gorter is also a visiting professor in rehabilitation at the University Medical Center Utrecht.